Today…was one of those days where I just never take a moment to settle in and eat something in the middle of the day. Always on the go. After hitting up the pool this morning for some laps, I was ready to get my shopping on. So, after returning home and taking a nice shower, it was off to the brand new factory outlet store that opened up in the Louisville area. Retail therapy…it’s great for what ails you and stresses you out. So is the pair of Tommy Hilfiger skinny jeans I bought too…but that’s beside the point. My point is…there are days that I just don’t get to sit down and settle into an official “lunch.” I am very good about eating breakfast and often make it the bulk of my daily meal. I hit up good protein sources, healthy carbs, and those healthy fats (HELLO AVOCADO!). Dinner is always a must, but it’s usually something very light and easy, unless it’s a weekend where I have some time to prepare an actual dinner…like a casserole or something…where I freeze the leftovers and keep them for those days where life is just spiraling out of control and the very thought of cooking a meal from scratch is too much to bear. But lunch. Lunch sometimes consists of oatmeal or overnight oats, especially during the week. It’s something light but filling. But on a day like today, where you’re trying to beat the crowds and actually find a parking spot at a brand-spankin’-new outlet mall…you grab and go. And that’s what I did, pulling open my kitchen drawer of “run snacks” and retrieving the next protein bar in the lineup. 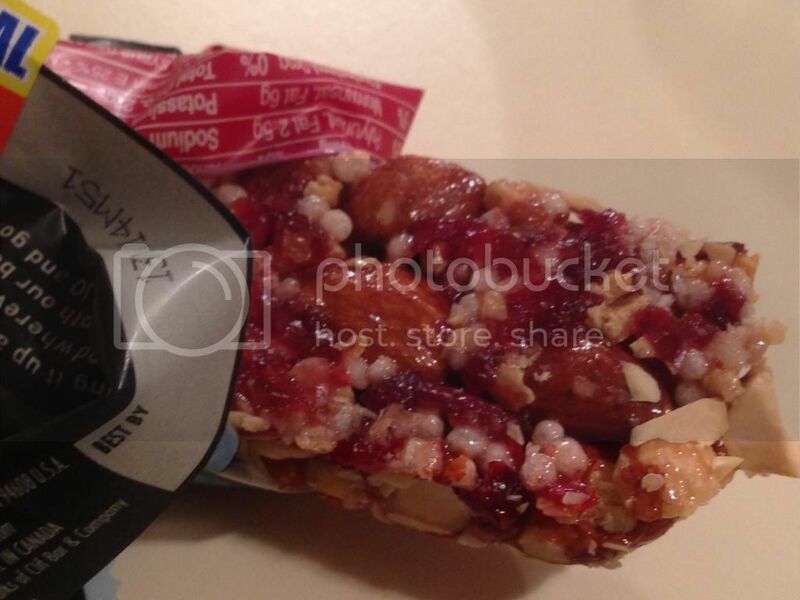 Today…the CLIF Mojo Cranberry Almond Fruit & Nut Trail Mix Bar. It was easy to transport and I figured I liked the blueberry one well enough, why not? So, my roommate grabbed her snack and we were out the door and hitting the road to check out the shops. On the way, it was time to fortify ourselves for what would be at the very least an hour and a half at the outlets. At least. She dove into her snack…and I broke into my bar. Once again, I have to make the fair comparison between these bars and the KIND bars. They are loaded with dried fruits and nuts, and you can see each and every ingredient right there. To give it some added bulk, CLIF also mixes in rice crisps…which you can also see. I was hungry from my time in the pool…so I took my first bite. YES!! CLIF one again hits the flavor combination on the head. In fact, I want to say it tastes a lot like the fruit and seed mixtures that are included in a few of the Go Picnic box meals every now and again. You know…the kind that Enjoy Life produces. That’s what this bar tastes like. It tastes like a sweet snack victory to me. It was chewy…yet not overly so. In fact, this one was a bit more solid than the blueberry, but I think some of that was due to the fact that it had been warm…then in my cool apartment…so it solidified. Nonetheless, I was loving each and every bite of this bar. It had that tangy zing from the cranberries and that hit of salt from the almonds. The rice crisps brought something chewy. And it was all bound together in this outrageously tasty bar. I had to keep myself from just shoving the entire thing in my mouth and chewing for about 10 minutes. I savored…and I’m glad I did. This bar hits all the right notes at all the right times. Amazing. So, let’s talk ingredients. 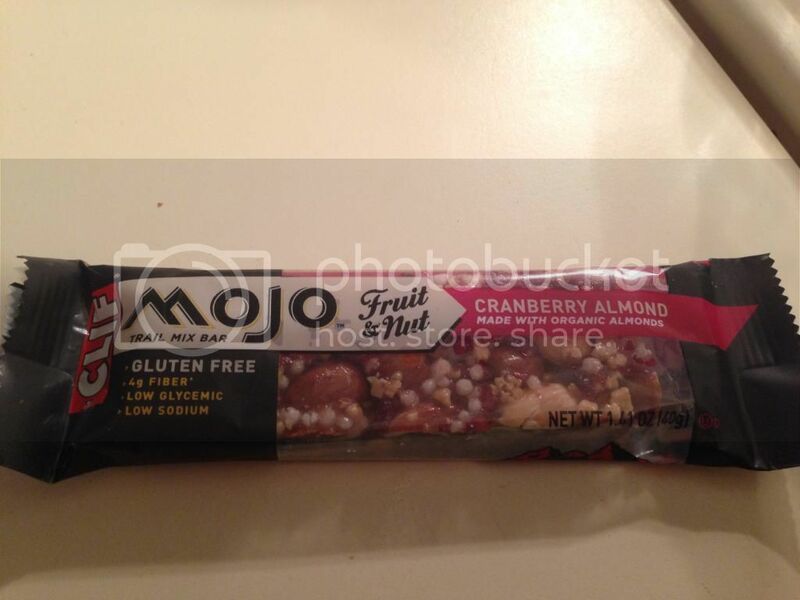 CLIF is proud to use non-GMO ingredients in their Mojo bars. And…about 70% of the ingredients are organic. In the CLIF Mojo Cranberry Almond Fruit & Nut Trail Mix Bar, you will find the following ingredients: organic almonds, cranberries, organic tapioca syrup, organic rice crisps, organic roasted soybeans, organic inulin, organic sunflower oil, sea salt, citric acid, and natural vitamin E. This bar is gluten-free, cholesterol free, low glycemic, and high in fiber. Nutritionally speaking, this bar definitely stands up to those that are similar to it. And in some cases, the stats are even better. A serving size is one bar. One CLIF Mojo Cranberry Almond Fruit & Nut Trail Mix Bar will serve up 180 calories and 10 grams of fat. Don’t panic over the fat. Most of that is derived from the almonds, making it a healthy fat. This bar also will give you 110 mg sodium and 11 grams of sugar. The sugar is higher than I like it, but I’m guessing some of that actually does come from the cranberries. And, you will also be consuming 4 grams of fiber and 5 grams of protein. So, you definitely will feel full after eating it and it does a good job of sticking with you. I’m finding a lot of great flavor, great textures, and great nutrition from the CLIF Mojo Fruit & Nut Trail Mix Bars. The two that I have tried thus far have blown me away. The flavors just blend so well and pop in your mouth. I guarantee that you’ll enjoy these bars. And…for that price…go ahead and stock up. I know next time I hit the store, I will be doing just that! This entry was posted in Breakfast, Food, Fruit, Gluten-Free, Nuts, Products, Protein Bar, Review, Snack Bar, Snacks, Sweet Stuff, Vegan, Vegetarian by The Celiathlete. Bookmark the permalink.